There are many factors that define who we are: genetics, the region we live in and come from, the environment we were raised in and the people who surround us. One other key factor that shapes us is the generation we were born into. People born in the same generation grow up in similar environments, experience the same trends and understand certain contexts. Many are also shaped by similar parenting techniques popular among adults in the generation that preceded them. They see the world unfold together, and although they come from different backgrounds, they share some similarities. However, when we put different generations side by side, you’ll immediately see the differences. Take the use of technology as an example: Younger people in Gen Y and Gen Z have all grown up with easy access to information. But their older peers including Baby Boomers grew up with paper documents and libraries as key sources of information. Ensuring that different generations can work together effectively under the same roof has always been and always will be a challenge for organizations. To establish strong roots in your organization, creating a stronger relationship between different generations is crucial. The following will explain why. The first reason is that regardless of how old or young the people in our organization are, we need to get everyone in a similar mindset if we want it to reach its full potential. No matter how far into the future the organization lasts, there will always be two, three or even four different generations working together. Second, each generation plays an important role in the organization. 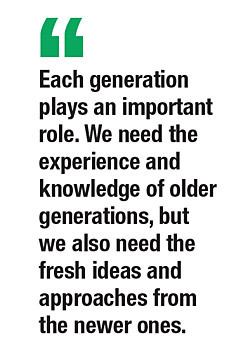 We need the experience and knowledge of the older generations, but we also need fresh ideas and approaches from the newer ones. We cannot ignore one or the other just because some of their views might appear to be in conflict. The third and final reason is that we will always face this challenge. Decades down the line, we’ll be looking at “old vs new generation” issues all over again. The best way is to prepare ourselves and our subordinates to deal with the challenge. Achieving harmony among different generations in the workplace is difficult, but not impossible. Yes, it is time-consuming and tiring, and there may be times when you feel all the effort is just not worth it. But the future of the organization and community depends on succeeding. Here are some things to keep in mind when aiming to harmonize the different generations in your company or team. The first — and most difficult — step is to listen. Having owned my business for over 25 years, and having seen different generations in my own company and those of my clients, I can tell you that not being able to listen to each other can be disastrous. To listen is not to bend to every whim — it just means opening your mind to new things and understanding one another. The second step is to understand the traits that each generation has in common, such as communication preferences, stereotypes, values, work ethic, and other characteristics. We will then be able to observe the similarities among different generations and can consider how to cross over and bridge the gaps we sometimes see with leaders or subordinates. Additionally, we can also keep everyone informed about the differences. The fact is, you cannot change people if they don’t want to change in the first place. Understanding the differences we all have from one another helps us understand why others behave in a certain way. This brings us to the third step — stay flexible. Everyone, despite the generation they belong to, has unique traits and preferences. Keeping things flexible is not only practical, it allows each individual to grow in their own way, thus allowing the organization to grow too. The fourth step is to establish respect. Regardless of age or level in the organization, the common element all generations expect from each other is respect. Just as entry-level staff needs to respect senior staff, the same must happen the other way. Respect is a basic form of common courtesy, and if we don’t consistently show it towards others, we cannot expect others to show it back. The fifth and final step is to continue learning. What we know today may not always be relevant tomorrow, and every generation realizes that. The best approach to this is to also learn from one another. What better way to understand others and the world than to learn from the other person’s point of view? The path towards generational harmony is a long one. But if we don’t try today, the problem will never end. And if we do not take this journey ourselves, we cannot expect others to begin. Arinya Talerngsri is Chief Capability Officer and Managing Director at SEAC (formerly APMGroup) Southeast Asia’s Lifelong Learning Center. She can be reached by email at arinya_t@seasiacenter.com or visit http://www.seasiacenter.com for more information.